Bioceramics: For Materials Science and Engineering provides a great working knowledge on the field of biomaterials, including the interaction of biomaterials with their biological surroundings. The book discussees the biomedical applications of materials, the standpoint of biomedical professionals, and a real-world assessment of the academic research in the field. 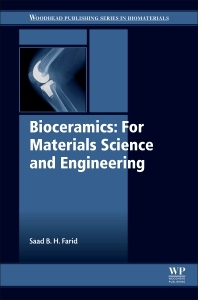 It addresses the types of bioceramics currently available, their structure and fundamental properties, and their most important applications. Users will find this to be the only book to cover all these aspects. Saad B. H. Farid is Professor at the Department of Materials Engineering, University of Technology, Baghdad, Iraq. He contributors to the update and the development of the curriculums within the subjects of Materials Selection, Ceramics and Glasses, Engineering Ceramics and Bioceramics. He is the leader of the PhD course on Advanced Materials Characterization, Dielectric Ceramics, and Advanced Ceramics (Including Bioceramics).